I love pretty much everything written by Amanda Hocking - My Blood Approves, Trylle, The Hollows - so I was dying to get my hands on an ARC of Wake. Thank you, St.Martins, for providing me with a copy! Going in, I knew that I'd like Wake because I'm picky when it comes to writing styles and Amanda is one of the few authors whose writing I actually connect with. What I adored the most about Wake was that there's not one but two protagonists. Sure, Gemma's story is the one that's really being told but her sister, Harper, plays an equally important role. These two sisters, though quite unlike each other, are both loveable heroines; Harper has a clearheaded, protective personality, while Gemma's fiercely loyal, strong and equally determined to get what she wants, despite her slightly impulsive side. And then there are the creepy sisters - Lexi, Penn and Thea. I know they're all fictional but I could totally picture them in my head and they weirded me out. It's like they were a combination of Mean Girls and the girl from Grudge (personality-wise). 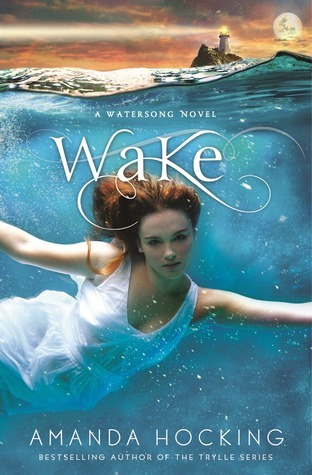 Hocking's biggest strengths have always been her unique plots and wonderful characters that literally make a book unputdownable and it's the same with Wake. Although the novel starts slow, around the middle is when it really starts to grip you; the mermaids/sirens' backgrounds and the Greek mythological references had me hooked. By the end of it, I was left wanting more and wanted them immediately. Since this is just the first book in the series, I'm guessing that with book two, Lullaby, is when the story really gets going and there wouldn't be a single slow moment. However, there was one thing that fell short for me - the romance. I adored Harper's storyline, Daniel was hot and I loved how their relationship progressed from dislike to friendship and maybe more. Alex, however, didn't do much for me. I seriously hope Gemma doesn't end up with him because he didn't seem like 'true love' or anything to me. I didn't really have the chance to get to know him or grow attached to him as their relationship progressed too quickly and didn't seem realistic. To put it simply, I was disappointed because Amanda has always written insanely hot romances - Finn, Loki, Jack, Peter, Lazlo - and although Daniel had potential, there was nothing addictive about Alex. Over all, although Wake didn't jump right into the action, it sets a strong base for Lullaby, which I'm seriously looking forward to, especially since it's out in four months! Amanda's characters and world are as usual, intriguing and wonderful. Wake is a mermaid story definitely worth reading!